I use to use this app all the time when my husband and I were dating. It was nice to have all the nutritional info and see the gorgeous images. I love trying new things. Big hit here. I agree with others who wish this app were better linked to all CL recipes. In addition, I would like to be able to add my own notes to the recipes we love. And why isn't the list of Favorites alphabetized? All that said, we love the recipes we do try. Very tasty, substantial, and don't take forever to make. I paid to subscribe to Cooking Light and tried to use this app to copy and save recipes in a recipe box. It doesn't do that. You can't even really search for recipes. It just saves a cooking light issue by month. There isn't even a bookmark option so you could go back to a magazine and find recipes you liked. Nose it won't even work on iOS 11. Terrible!!! I love this app. It WAS my go to app for dinner plans on he fly. I say WAS because after the most recent Apple updates, itNO longer works! UGH!!!!! Please, PLEASE, P L E A S EEEEEE! Update this app. Needs update for IOS 11!!! I love the idea of the menu maker and nutritional info, but can't rate higher as the recipes get old after a while. It would be great to have a seasonal update. I'd also like to see an opportunity to rate/comment on recipes and menu combos. I love the cooking light magazine and web site, but this is so very disappointing. There are only about 6 recipes per category. No way to sort by ingredients. No overview of recipes included. No cut and copy availability. The pictures are nice, and the menu planner with nutrition info is good but that's about all it's got going for it. Not worth keeping if it had been free - definitely don't waste money on it. Hugely disappointing for its lack of searchability. I'd expected much more from Cooking Light. For a good healthy cooking app, download the free one from Whole Foods. I like the concept of the app. It does have nice photography and it is helpful in that it gives me fresh ideas for healthy dinners. What I don't like is it does not let you search. I also wish it would let you print the recipes and create shopping lists. I am very disappointed with this expensive and large app. The creators mistakenly emphasized optics over substance. I had hoped this would have the breadth of amazing recipes on the Cooking Light website, but it falls far short of that. The app provides a drop-down menu for each protein, and then you're forced to scroll a very limited universe of recipes. There is no search engine. Do not waste your money on this app. Very limited amount of recipes. They mix and match ingredients but in reality its only 3 or 4 different plates. Don't waste your money!! Awful. No search option. Choices limited to what CL decides to offer. I use CL recipes daily, but deleted this app. Not user-friendly at all. Boo. Very disappointed in app. Love the magazine But hate the app. Searched in Google for a recipe, and found one on Cooking Light's website, but the website forced mobile and I couldn't see the rest of the recipe and was directed to use the app. After paying $3.99, the app didn't even have the recipe. I feel ripped off and now I'm stuck with a useless app. Might be better with a search function, but with the small amount of recipes it isn't actually needed right now. Limited recipes, why would this app cost so much and have limited recipes? You can get more by searching the web for free! Very disappointed, this app would only be worth the money if it had a database of recipes! Don't waste your money!!!!!! I thought I would be able to access more recipes, or at least search recipes, but I cannot do either. I can't believe that they charge this much for so little. As a subscriber, I expected more from this app. This should be a great app, but is not. As for this update - I have tried but cannot install it. This app is wonderful. Based on prior comments, they must have recently updated with recipes because there are now tons to choose from. For me, the biggest thing that is missing is a consolidated shopping list for the meals. Still, I think this is something I will use a lot! Seriously the worst app ever. Not even close to being worth the money. Can you add a search function please? As you add more recipes to the app I'm sure it will become invaluable. Really wish there were more recipes... not many at all! Terrible.... It is very expensive for what I got.... It is just a couple of Recipes. I can NOT believe the price of it. I Don't even deserve one star. This app IS almost an INSULT. This app used to be decent. It was never a comprehensive source of all CL recipes, but there were decent options. The latest update killed this app. There isn't even a search function!! And, as one reviewer mentioned, there are only about six recipes per category. This app is now all about art and pictures and not at all about cooking. Save your money and your GB (it's huge); this one is a waste. Why wouldn't this have a search function? What a waste of money. Don't bother. This is nothing like the website, you can't access your saved recipes, can't search, and you only get limited recipes. So not worth $4!! Not worth $3.99. You can't even access your saved recipes. Waste of money. Recipes are never updated and there are no reader reviews which makes it pretty stale after a month. ...only thing missing from this great app. Someone needs to update this app!! Amazing recipes, but there's no search function?!?! That's such a basic necessity!! I love this magazine so much but they're missing out on so much with this app!! It is important to read the description and/or reviews when buying an app, as it seems that most of the negative reviews relate to being disappointed when the app was not what you imagined it to be. 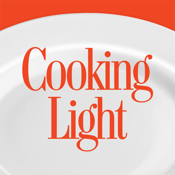 I absolutely love Cooking Light recipes, books, magazines, their website, and this app too. I use this app often when I am running errands and realize I need to plan dinner and stop at the store. This app has saved my dinner plans on countless occasions, because I can find great recipes instantly. Also, once you pick an entree OR a side dish, you can select "suggested menu," and it will give you a suggestion for a complete healthy meal (including a dessert! ), with the option still to pick a different side/entree, or the option to completely take the dessert or sides off the menu for that night. Additionally, you can see the nutritional value all added up for the entire meal. I LOVE that! The app warns you if the recipe is a longer, more time involved dish, which is helpful too. I have made almost everything on this app. My favorites include the Asian Lettuce Cups, the White Bean and Hominy vegetarian chili, the Filets with wine sauce, the pork with cherry sauce- there are SO MANY good ones, Yes, a search feature might be nice. However, I use this app so often that I am able to quickly and easily find whatever it is I am looking for. It also breaks things down into categories including entree, and within that, you can select poultry, pork, vegetarian, fish, meat, pasta, etc. Within the sides, you can select salads, pasta, potatoes, etc., and for desserts, you can choose quick cook or no bake. There are only a couple of egg/breakfast type foods within the vegetarian option, so I would avoid buying this as a breakfast menu planner. But for lunch or dinner, this is a really great app! I have had it a long time. At one point, an update added additional recipes and those were included for free as I already had the app!! :) It is NOT the magazine, so download a different app for that. I love it and can't recommend it enough. I made my mom buy it too!! Lol. Maybe I don't have a lot of expectations, but I'm surprised that this App isn't rated higher. I use it all the time to plan menus for the week. I've made great meals and I love that I can mix it up a bit. I rarely make the desserts, but I've tried many of the entrees, and side dishes. All I want is a good recipe that is not complicated and delivers good-great tasting food, and I've gotten this from this App. This is my first go-to App when I'm in a rush and need something that will deliver a good meal. 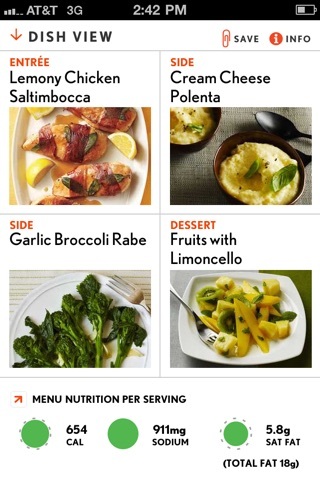 This along with my Cooking Light Magazine App are what get me through the week with good health meals. Great app but not enough recipes!! I love the functionality of the app but there are so few recipes!! What is up with that? Nowhere near 300 recipes. Come on release more recipes!! This app has been one of my poorer purchases. 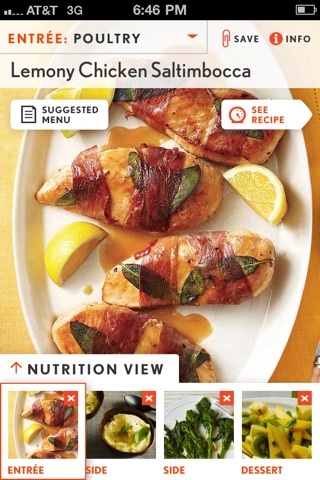 The app does not give you the ability to search through all cooking light recipes, or any for that matter; there is no search tool. I needed the search tool especially because I was interested in making a soup which there is not category for. I expected MUCH more for my $3.99. I got the app and can't even download it. I deleted half my apps bc I was so excited to get this one just to keep saying there's not enough storage and there is. I wish I read the reviews first. Wow! This app is a complete ripoff. I would have given this app a half a star rating, because frankly it doesn't even deserve 1 star. I'm completely steamed that the app only suggests recipes, it does not allow you to search for your own recipes. I want my $4 dollars back cooking light! I love the software online. This is a joke. No search. 10 chicken recipes. Awful! 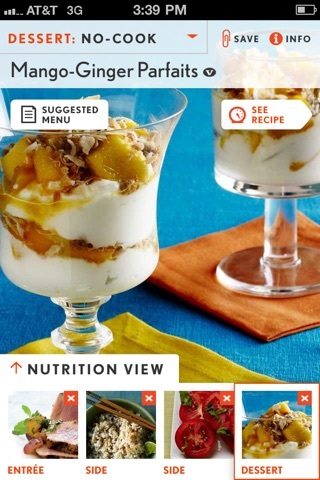 How is it possible that Cooking Light created a recipe app without a search function? I should have read reviews, but I was 100% confident there would be a search function given the app is not free!!! Only a handful of Preprogrammed recipes! Terrible app. All meals are easy to make and delicious! I receive the cooking light magazines and they rave about their new app. 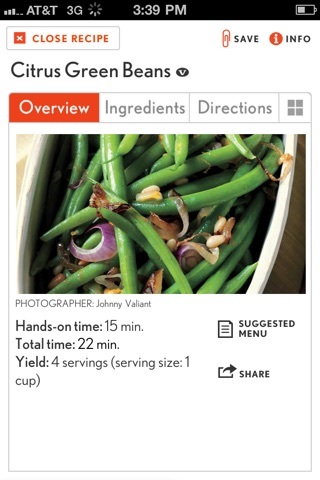 They boast about the ability to take a snapshot of dishes in their magazine using their app and the recipe will load. I can't seem to find that option anywhere. I like an app that works as it is described and is intuitive. This could be a good app if it is tweaked and the option buttons were easier to spot. I'm hoping the improvements are made so this app can be more user-friendly. I can see myself enjoying this app once it is improved. Hopefully it happens soon. I thought it would be nice to be able to build meals with this app. But there were very few options and just did not satisfy. If it had more extensive list of recipes would be better. I got a refund. Limited recipes but they are yummy. Wish we had access to more recipes. I love the recipes in this app. I use it often. Many reviewers didn't like the app because they thought they were buying an app that enabled them to search for CookingLight recipes. They should have looked at the app description before buying it. What I don't like is that it hasn't been updated for iOS 11 and may soon be unable. Come on! Update for iOS 11! Just started the Cooking Light Diet and this is a great resource for more recipes. I do wish it had a search feature. The sorted sections work fine however. Just made a menu for the week. Now create a CLD app... Please. I was very disappointed that for a $3.99 purchase price, the recipe catalog is so slim and there's no search feature. I love Cooking Light recipes but we are vegetarian so it doesn't make sense to get the magazine or cookbooks. I love this app. Beautiful photos and delicious easy-to-make meals with side dish and dessert suggestions. Can't print but can email the recipe and use it at the grocery store easily, or use it right from my phone or iPad mini. A search feature would earn the last star. I am very disappointed with this app and wish I had read the reviews prior to purchasing. The fact that there is no search bar is a major issue. Additionally, the interface is not user friendly as it only allows the viewer to see one recipe at a time. This aspect makes perusing more time consuming than I would like. I have been enjoying and utilizing the free apps Garden Plate and Zipongo much more than this one. I thought maybe the few choices were just a preview of the ap. Then realized the 10 items per category are really it! I can't believe they charge for this. Do not purchase this app..it is not worth the money. You can't search for anything, you can only scroll through a very limited number of recipes. Once you do have your "menu" selected, there is absolutely no way to collate the ingredients or get a shopping list. I want my money back. This app was last updated 4/2013, and will likely just die with the release of iOS 11. The recipes are outdated, and Cooking Light apparently does not view this as worth supporting. I thought the recipes would update....? This is it? You guys need to update the recipes once a week...how hard would that be? You're magazine is great...what's up with your app? You guys need to catch up..we're all on these devices ....your too old school...seems like little to ask 4 bucks for an app is a lot....as is not worth it. This is not a searchable app of the magazine recipes. This is a FEW menu option recipes. Very very disappointing; especially since it costs. Really disappointed. Can't search like the website. How can this app not have a recipe search?! Completely useless otherwise. Dumb. 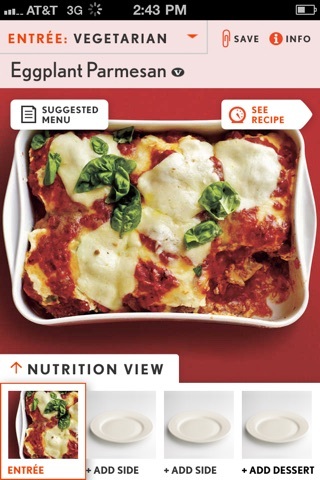 I bought this app because I Love the cooking light website and the recipe box. I assumed that this would just be an app form of the recipe box but I was wrong. It is very limited in it selection and there is no search feature for me to find my favorite recipes. I would be very happy if the app were an extension of the recipe box feature on the website. I feel like I paid for something I could have gotten for free elsewhere. And I'm going to just continue using the recipe box online. Please consider making the app into an extension of the recipe box. That's such a great and helpful tool, and making it into an app would be wonderful and well worth buying. I should have read the reviews first. This app does not allow any searches. You have to scroll through recipes one at a time. Really? That's the best you can do, Cooking Light? This has the potential to be a great app--I like how it suggests meals for you, and I would've given it 5 stars if it were a free app. BUT it needs so many more improvements to be worth the price I paid for it. It needs a search feature, at least for suggestions for different meals, if searching for a specific recipe is never going to be an option. For example, I'd like to be able to log in and search through breakfast recipes in the morning, and get some suggestions. As of now, you can only see dinner entree, side, and dessert suggestions. I also follow the cooking light diet, so being able to track my recipes for the week on my phone (without having to log into the actual website) would be awesome. Please add some features to this app, and it will be great. I also expected to be able to search recipes from the magazine. Instead, I have limited choices from items that are all very similar in nature. I can do better doing a google search. Pretty disappointing as far as usability and the limited number of recipies. Definitely not worth the 4 bucks. This app is a total disappointment. I thought I'd be able to look for recipes from the magazine, which I subscribe to, to make shopping easier - bring the phone, find the recipe, do my shopping. What a scam - you can only look at their pre-programmed recipe, and there is no search feature - a total rip off for a $3.99 app. Buyer beware. I only gave one star because zero stars is not an option. Loved the app but doesn’t work on iOS 11 anymore! What a shame...! Hey. Can you update this app so I can use it on IOS 11. This is an awesome app. I’d like to continue to use it but you aren’t compatible. Do you have these amazing recipes on another CL app?